Rate (item arrived). Canada Rate (item arrived) 0.0% 47.1% 31.4% 17.6% 3.9%. Item Number: 602631. Size: 6.8 3.3 1.2in. United Kingdom. Fashion New Secret Garden: Bird Magic Mirror Coloring Book Of Adults Kids Gift Z. High quality Suitable for use with gel, arylic or fibre glass applications. They are for professional natural nail extension making. Can chop/cut to the style you like! Easy to use, perfect decoration and long lasting. Quantities: 500Pcs. 1 x 500Pcs False Nails Total. Good gift for your wife or girlfriend. Type: False Nails. Great for both professional nail specialist or nail art learner. Manageable for even a novice to the pointed nail craze. Empty storage case box for nail art. Color: translucent. There are 10 separate rooms for storage. Perfect for storing glitters, rhinestones, shiny sheets or other products. Quantity: 500pcs. Size 0-9 (50pcs of each size, total 500pcs). 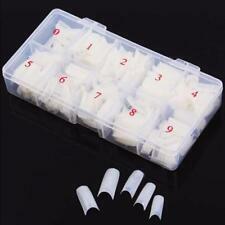 500pcs False Nails Box. Suitable for use with gel, arylic or fibre glass applications. Color: Natural. Box size: approx. 18 x 9 x 3cm. Half nail tip design: Cover only the free edge of your nail, not the whole. - Easy to apply and hold with nail glue. - You can add nail art decorations on your fingernails and design your own style and pattern. Single Eyelashes. • Ideal for False nails/eyelashes, scrapbooking pieces. - 1x empty storage box. False Nail Accessories. Nail Brush Sets. Storage Box - 10 Chamber Case. 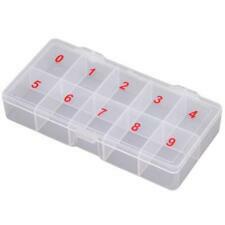 • Storage box with 10 seperate, removable chambers. Professional Nail Art Tool for Nail Technician. Can be used for your nail art. Suitable for use with gel, acrylic or fiberglass applications. Size:in sizes 0-9 (10 pcs of each size and totally 100pcs). Item Number: 602631. Rate (item arrived). Canada Rate (item arrived) 0.0% 47.1% 31.4% 17.6% 3.9%. Size: 6.8 3.3 1.2in. United Kingdom. United States. Lightly buff nail surfaces with a fine file to maximize adhesion. - apply nail glue as well on your natural nail. - Easy to use, to DIY your French nail art manicure. - Suitable for use with gel, acrylic application.